How long have I been a stitcher and how did I first learn about stitching? I would have to say I wasn’t too old, before I had needle and thread in hand. Although it was embroidery, but to me, embroidery is so closely related to counted cross stitch, that I group them into the same genre. I was old enough to be in 4-H, I do know that, because I spent many hours embroidering a set of pillow cases to enter in 4-H at the local county fair. Although at the time, I couldn’t understand why my mother was so upset, that when the fair week was over, we went to pick up my fair entry and it had been stolen. Today, I so understand why she was upset because I would really love to have that pair of pillowcases today. As for counted cross stitch, I was pregnant with my 4th child and a good friend, gave me a short lesson in the backseat of a car…her husband and mine were in the front seat and we were on a short one day road trip. Needless to say, I was hooked on the counted cross stitch form of needlework, and have had at least one project in the works since that time, 29 years ago. And that adds up to a grand total of more than a half century that I have had needle and thread in hand! What a journey! I don’t know that I stitch by themes, but I do often have a verse or saying come to the surface of my mind and I immediately think I want to design something to honor that verse/saying. I do love houses and trees, so that said, a lot of my designs lean to a pastoral scene ‘loosely’ defined. I do have one series or theme I am particularly fond of, and that is the Emma Rose series. Emma Rose actually existed, she isn’t just an imaginary person I thought up; she was my great grandmother on my paternal side. I remember visiting with her when I was a young child and I was always enchanted with her; her house, her gardens, her baking and the quilt she invariably had set up on a quilt frame in the front parlor. My desire when I first started designing was to honor her with a sampler…that first sampler was Emma Rose Friendship. Because of the warm response to Emma and that first sampler, I decided to follow it with Emma Rose Christmas. A year or so later Emma Rose Freedom was born. I am not sure what Emma Rose will be next, but I definitely mention something on my blog. 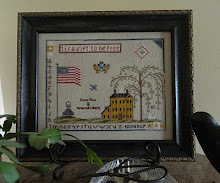 I encourage stitchers to make the Emma Rose series of samplers, their own, by personalizing with their own family records. If anyone ever needs help in doing so, I would be so glad to help, just send me an email or give me a call. I always enjoy hearing from stitchers. I do some of my own stitching, but I also have some wonderful model stitchers that are ready at a moment’s notice to help me out! And they do so in such a timely and professional manner! I love my model stitchers! But when I do my own stitching, I have found that mistakes are found, colors and even the design is changed, as I stitch. This is the preferable way, because I truly believe that this is part of the design process for me. But because I am a very slow stitcher, coupled with the extra time it takes to ‘edit’ as I go, my model stitchers are a God-send to my professional life! Gosh, there are so many wonderfully talented designers in the market! We are indeed blessed with much talent and creativity in which to choose from, when we need just ‘that right’ design! I remember overhearing a designer say at a needlework market, many years ago, before I started designing myself, that the style in which they designed was clearly different then the style that they were drawn to for their personal stitching. I wasn’t sure at the time, what they meant by that, but I do get it now. 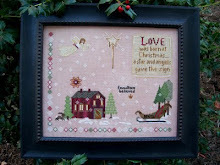 This said, some of my favorites in the counted cross stitch industry are La-D-Da, Plum Street Samplers, Prairie Schooler, Chessie n Me and I cannot forget to mention Tanya of Scarlet House; she has indeed reproduced some lovely antique samplers! I gravitate to these designers for my personal stitching, and they never fail to grab me with their newest and latest. What would you like to say to your fans that are reading this? It may seem cliché to say ‘Thanks’ for your support and encouragement since I started designing in the early fall of 2009! But I mean it, so there you are! I got a late start, but it has always been a dream of mine to create and publish my own designs. I count myself very fortunate to have realized that dream and you, the stitchers that have purchased my designs and given me encouragement along the way, have been a HUGE part of me achieving that dream. Thank you, thank you, thank you! I really love to hear from those of you that email or call with a question or share a desire for a certain subject to be designed, so keep those emails and calls coming! It is intrinsic to my motivation to design! I have been blessed with a family of 4 children, 2 sons and 2 daughters. 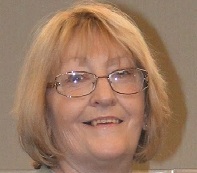 I also am a grandmother, (they call me Nana) to 3 lovely small grandbabies, all under the age of 3 years, 2 girls and 1 boy. Step grand to 4, 3 boys and 1 girl. They bring so much joy and love to my life I honestly cannot imagine my life without any of them in it. 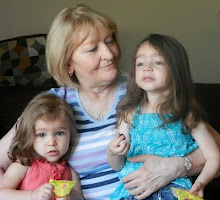 I don’t see the grandchildren nearly as often as I would like, since they all live hours away but we do try as often as possible to visit, so they can know Nana better. Next week, my youngest daughter and son in law along with the 3 younger grandchildren are ‘ganging up’ on my oldest daughter…it is her birthday week and what better way to celebrate, then getting to spend it with other family members, right? I am so looking forward to creating fun memories! I just was recently adopted by a wonderful new girl puppy, just over a year old! She is a beagle mix and her name is Bandy and just full of love and energy which is true of most puppies her age. Frankly, if you couldn’t already tell, Bandy has stolen a portion of my heart! If only, she would honor my female calico’s right to queen ship of the house, all would be a bit more peaceful! Actually Bandy just wants to play and Boo, my calico beauty, just wants her to go away, or at the very least stay out of her way and quit trying to play with her! I am hoping that one day soon, they will become ‘buddies.’ In the meantime, Miss Bandy gets banished to the fenced backyard, quite often because of her antics. When she is behaving herself, she likes to nap at my feet in the studio/office while I am working. I would have to say at this point in my life, I have achieved a great deal. I certainly don’t mean that in a boastful way, but that my years on earth have been plentiful already. I do pray that those years are still many, because I have a lot of designing and stitching to do, but only the Lord God knows how long my life will be. Given that, the one thing that I desire to do, is to be the best grandmother that I can possibly be to my precious grandchildren. I didn’t have them at a young age, but I am certainly blessed to be able to enjoy them now. I hope that I can see them grow into young adults and have families of their own. This is the achievement I seek most in my life, to be that someone they truly can take joy in knowing, maybe learning from and just spending time with. The Lord Jesus Christ. No one else has come close to the influence that He has had over me and my life. His influence is the best I could ever hope for. The people in my life over the years that have inspired me have been many. Inspiration has come in many forms through friends and continues to this day. And I am grateful for the inspirations, but I would have to say that my children have inspired me the most. Not only are they my children they are also my friends, and their words and actions have played a huge role in the person that I am today. My oldest daughter, Megan, is a continual inspiration to me, with her words and admiration concerning whatever it is I am doing. She has a busy life, with her hubby, step kids and job, but she always manages to call me when she gets the chance, and that can be several times a day. Meg’s sister, and my youngest daughter, Ashley, is also always supportive and calls herself ‘Mama’s personal assistant’! Isn’t that cute? But she is so organized and I fall short in that area, so I am seriously thinking of giving her the job! Wonder if she can really fit me into her busy schedule of raising those small precious darlings, the little people I call my grandchildren? Seriously though, if I ever need support, if I ever need advice, these two wonderful young women that I am fortunate to have as daughters, inspire me with their life experiences and love. My sons are inspiring as well, always protecting Mama and lending a hand when patterns need to be printed and packaged and shipped off to the distributors! One other person that I cannot fail to mention as inspiring me is a lovely young woman by the name of Lori Monroe. Lori is like a daughter to me and her contagious smile and positive outlook on life, never cease to inspire me. Lori has Muscular Dystrophy, but she always perseveres through whatever challenges life gives her, with that beautiful smile and the love she shows those who are blessed to know her. J I am blessed! And I have told all of my children that I need a license plate frame that says just that! Click here to see more of my designs! I have been open for 24 years! 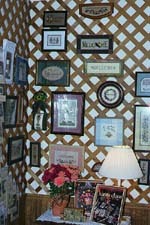 Our shop was started in 1988 in an old Victorian 2 story house in downtown Crystal Lake, Illinois. As our products and services expanded we out grew our quaint residential setting. 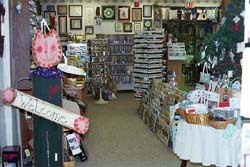 We are now located in a more spacious and accessible facility in the retail area of Old Downtown Crystal Lake. Some of my favorite designers include The Drawn Thread, Little House Needleworks, Rosewood Manor, La-D-Da, and Blackbird Designs. Have you ever attended a TNNA trade show, and if so what are your thoughts on it? Attending trade shows is beneficial in many ways. It is a great way to be introduced to the newest designs and products as well as to meet and share ideas with other shop owners. It also offers great educational opportunities. Most of all, it gives me a great psychological boost and enthusiasm to bring back to my shop! Priceless! Do you have an online web store, and if so how do you feel it has affected your business? I thoroughly enjoy spending time with my grandchildren when I can. I also love to read and knit. There just aren't enough hours in the day! The older I get, the more I enjoy Christmas because it is such a great family day. I have fond memories of Christmas growing up and want to carry that on for my family. Sometimes tradition becomes doing something totall different and never the same thing, but there are some favorite cookie recipes that never change. My family loves just coming together. I like a lot of different types of music, but enjoy Easy Listening, and New Age probably the best. I would want to help every person I know and some I don't. First, I would pay off my daughter's school loans and make sure my son and his family were taken care of. Most of the time I forget to buy a lottery ticket, so I guess my chances are pretty slim. I can still dream. My parents are my greatest inspiration. They both instilled in me good values and great work ethics and were beautiful examples, each in their own way. I miss them very much. THANK YOU FOR READING THIS WEEK'S EDITION OF NORDEN'S NEEDLEWORKERS. Thank you for sharing it ..I really enjoy so much reading it.